Model size: 9.5" x 7"
Background Information: I love the look of white on white. So, I decided to try designing a piece using primarily the textures of the different specialty stitches to create visual interest. Pastel touches of color and beads were added as accents. Stitching Comments: You won't get bored stitching this design; there are lots of different stitches to hold your interest. It is also fairly small (as my designs go anyway!) and moves along quickly: the chart is very clear. This piece could be adapted to commemorate a special occasion such as a wedding, anniversary or birth. 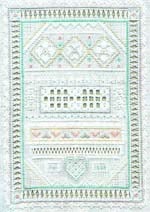 Specialty Stitches: queen stitch, eyelets and variations, smyrna cross stitch, rice stitch, long-armed cross stitch, four-sided stitch, herringbone stitch, satin stitch, horizontal knitting stitch, spider's web, hemstitch, knotted clusters, and hardanger.